WZK72587 Bugbears Patfinder Battles Miniatures Unpainted WizKids Pathfinder Battles Deep Cuts Unpainted Miniatures line features a number of distinguished creatures and characters. Each pack will give painters the opportunity to explore the fine details of each paint-stripped figure in full and find their artistic side to create a unique look for each figure. 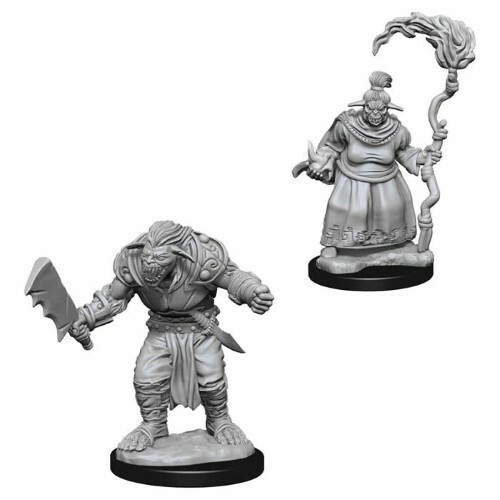 Pathfinder Battles Deep Cuts Unpainted Miniatures comes with 2 diverse, highly-detailed figures, pre-primed with Acrylicos Vallejo primer and includes deep cuts for easier hand painting. The packaging of each different set will display the minis in a visible format. - Contains 2 miniatures with 25mm round thin bases. - All Pathfinder Battles Deep Cuts unpainted miniatures work with the Pathfinder role-playing game - All miniatures are unpainted. - These highly detailed miniatures are pre-primed with Acrylicos Vallejo primer and include deep cuts for easier hand painting..